Stress fractures are small cracks in bones caused by overuse. According to the American Academy of Orthopaedic Surgeons, or AAOS, stress fractures are one of the most common injuries in sports and are caused by overuse of muscles that are too tired to absorb more shock. The AAOS adds that most stress fractures occur in the weight-bearing bones of the lower leg and foot. Lower-leg exercises are used to help rehabilitate and build strength in the area of the stress fracture. According to the Sports Injury Clinic, stress fractures are usually rehabilitated by resting from or avoiding running, jumping and high-impact activities for about eight weeks. However, patients are encouraged to maintain as high of an activity level as they can without those activities. According to the Sports Injury Clinic, the goals of the eight-week rest period are to strengthen and stretch the muscles of the lower leg and to maintain an aerobic exercise routine. Calf raises are one of the well-known and effective exercises to strengthen your calf muscles of your lower leg. They can be performed by standing on a step or raised surface with just your toes on the step and the heel of your foot hanging off. Simply rise up on your toes as high as you can, hold the peak position for one second and return to the starting position to complete one repetition. Reverse calf raises work the anterior tibialis muscle at the front of the lower leg. To perform, stand on the step with your heels on the surface and toes hanging off; then raise your toes up as high as you can toward your calf, hold the peak position for a second, and return to the starting position to complete one repetition. The Sports Injury Clinic also recommends balancing exercises on one leg, involving staying up for two minutes without wobbling or losing your balance. In addition, they recommend performing in-and-out foot exercises, which involve pushing with the inside and the outside of your foot against a person's resistance or resistance from a solid object such as a chair. Stretching can help restore range of motion and strength and reduce pain in the injured area. 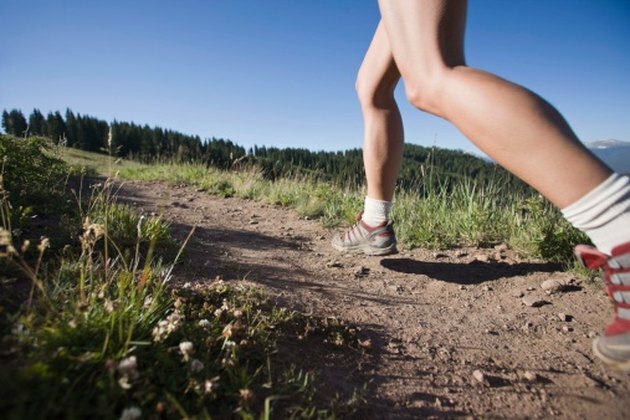 The Sports Injury Clinic recommends focusing on stretching the lower leg muscles and the Achilles tendon. To stretch the gastrocnemius calf muscle and Achilles, stand against a wall with the injured leg behind your other leg, and keep the injured leg straight. Bend your front leg and anchor the injured foot to the ground. Lean into the wall while keeping your back heel on the ground. You will feel a stretch along the back of your lower leg; hold the stretch for at least 15 seconds. Simply bending your back leg while performing the same stretching method will work the soleus calf muscle. You can work the anterior tibialis at the front of the shin by kneeling down and then sitting down on top of your heels. Push down on your heels until you feel a stretch in the front of the lower leg; hold the stretch for at least 15 seconds. Standard aerobic exercises such as jogging, running or using an elliptical machine should be avoided with stress fractures, but you do have some alternatives. Maintaining aerobic fitness will help speed up the rehabilitation and healing process. Swimming, cycling or running in a pool may help. All of these activities give you a good aerobic workout while protecting the injured area. Aim for at least 30 minutes of aerobic exercise three times per week.